In a packed episode, Andrew Nixon (@andrewnixon79) and Russell Degnan (@idlesummers) discuss the recent ICC meeting and speculate on the possible meanings of ambiguous ICC press releases. Andrew interviews Matt Featherstone from Cricket Brazil about the South American Championships, and the challenges growing the game in a populous nation with little coverage. We review the Stan Nagaiah Trophy, won by Malaysia, and preview the European Division 3 T20, the ACC Premier and the East-Asia Pacific Women's T20. There is also news from Hong Kong and (as ever) the USA. Finally, Russell is urging everyone to get behind the new academic sports-writing site The Allrounder which has a Kick Starter running until the end of the month. Direct Download Running Time 52min. Music from Martin Solveig, "Big in Japan"
The associate and affiliate cricket podcast is an attempt to expand coverage of associate tournaments by obtaining local knowledge of the relevant nations. If you have or intend to go to a tournament at associate level - men's women's, ICC, unaffiliated - then please get in touch in the comments or by email. Continuing the gianduja theme* I recently put together a pistachio slice, layered with a chocolate/caramelised pistachio top, and a pistachio paste/white chocolate gianduja. It went over very well - some people really like pistachios - but I thought I'd try something more complex for Easter. 1. Put still warm ingredients in a food processor and grind until oil is released and paste is smooth. 5. When set, pinch off pieces, working together into small round balls, then press into oval shape and set aside. 6. Drive a toothpick into the base of each egg. 1. Put ingredients in saucepan and heat, stirring, until sugar is partially caramelised. 2. Press flat marble board until cooled. 3. Crush with mortar and pestle into small pieces. 3. .. then press toothpick into a cork mat, leaving each egg upright. I had originally thought I could roll the eggs in a bowl, adding dark chocolate bit by bit until they were all coated. But I had no bowl big enough to get them to roll, nor did I trust that they would neither disintegrate nor coalesce into a single (tasty) pistachio chocolate ball. But nor did I wish to have flat bottomed sides as with a truffle. The upright toothpicks allow the chocolate to drip off the eggs, keeping a rounded shape. 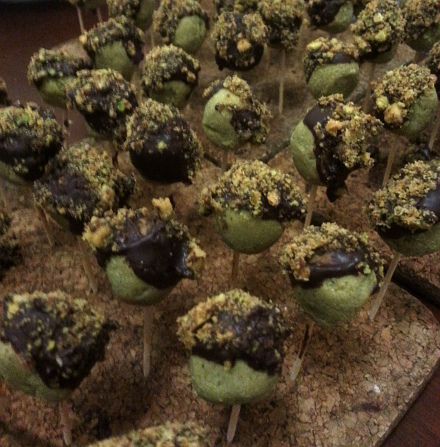 Though very little did, and the bigger aesthetic issue was the large-ish pieces of pistachio that made them uneven. I could have dipped the eggs completely in chocolate too, but I thought I'd keep that flash of green. There are quite a few steps here, and some take some time, but if you are a fan of pistachios they are definitely worth it. The slice mentioned earlier is essentially the same recipe, but with the chocolate and bits used as a base, and the pistachio gianduja slabbed onto the top. It is much faster - no rolling, picking, or dipping - if you aren't looking to create egg shaped objects. * I also made Grand Marnier flavoured truffles, rolled in cocoa, nuts and candy bits, simple, and not worth posting about. I wanted to largely avoid dipping chocolate this easter, though that won't be the case entirely. I've been recently experimenting with gianduja - the mix of nut paste, sugar and chocolate - and wanted to try and create something hot cross bun like. Many, many things went wrong. But the smell is divine, they look cute, and taste not so bad either. 3. Add currants to mixture. 5. Line pan with baking paper and pour into slab. 6. When set, cut into inch squares. 7. 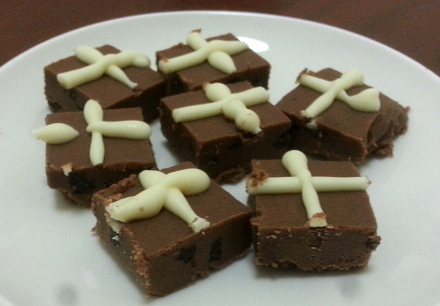 Melt white chocolate and using a small nozzle create crosses across each piece of chocolate (or, as is easier, in rows). Peeling hazelnuts... isn't ideal (almonds are slightly easier). I tried several methods. The method by Alice Medrich is clearly the best: boil for a few minutes in water with a few able-spoons of baking soda. The toasting needs to be a little longer than normal to compensate for the increased moisture, as the paste needs to be dry before the oils will be released. With regard to the nut mix, do as you see fit. I didn't want a purely hazelnut taste, but the key to the taste are the spices. Processing the nuts always causes me enormous trouble - in this case a cut finger and a burnt out mixer motor. This is probably the fault of my food processor that habitually leaves a hollow cavern of half grinded paste, spinning pointlessly. The use of both a whisk (?) attachment and the cutting blade - and eventually just the former - managed to keep the mixture circulating better, but it took a long time (> 90 minutes) to break down. The rest of the process is straight-forward, even simple. Gianduja doesn't need to be enrobed (although a base layer might be preferable) so the pieces can keep the colour and texture. It would be nice to create a more rounded top - perhaps by pressing the mixture while partially set, but who has that kind of time? It is difficult to know how to assess what will be the true motivations and effect of the ICC governance reforms. Srinivasan and the BCCI are almost admirably direct: they expected more money to guarantee their future participation in ICC events, and they got what they wanted. There has been no hiding from this fact by anyone party to it; both Wally Edwards and Giles Clarke highlight the threat that India would withdraw from ICC tournaments in interviews, and argue that it isn't a risk they are willing to take. "During my tenure at ICC, I have at all times, furthered the interests of BCCI. My crowning achievement has been to effect a re-structuring of the ICC and a re-working of the financial distribution model to reflect India's contribution to the economics of world Cricket. As a result, BCCI now stands to receive 21.6% of the top line of the media rights and sponsorship income of ICC, for ICC events between 2015-23. Further, it has been agreed that even in the subsequent cycle, 2023-31, BCCI cannot get anything lower." The motivations of Wally Edwards and Giles Clarke are harder to assess though. Their belief in the worth of the actions taken seems genuine; a pragmatic need to ensure India was onside coupled with a belief that cricket will be better placed with a change in the constitution and the introduction of the test fund. Whether a substantial amount of coin is sufficient to stop the BCCI from being "unhappy", given they already had de-facto control over board decisions remains to be seen. Their junior partners seem to believe they are now on the "inside", from which we might conclude that by sidelining BCCI's lackeys on the board in favour of a smaller executive council they believe they can influence decision making in their favour. At least in some respects they may be correct; but in many other respects this is no great boon. In both mens' case, the evidence points to a singular lack of vision and a limited understanding of modern sports administration. They've been elevated to their position because of their connections and time spent in the sport. Given a forum to demonstrate their capacity to lead, we are left with platitudes, statements inconsistent with action and a clear lack of expertise. The title of Clarke's piece in this year's Wisden - "Our vision	for a better game" - doesn't live up to its billing. It is a facile and banal piece, pre-occupied with the finances of the ICC administration and the injustice of cricket administrators being held up to public scrutiny. Decisions have been made; but Clarke sees no need to justify their worthiness. They need to be judged though, because they are often inadequate to the goals they set themselves, the product of a system that resists both scrutiny and outside expertise. A classic example concerns Clarke's comments on digital streaming. Stating that internet piracy was cricket's biggest threat was laughable, but his lack of knowledge is damning. As Mike Jakeman relates in a Radio Cricket interview, Clarke had no knowledge of a major revenue stream of American sports. The ICC, even after some success streaming cricket at associate level, still failed to provide that service for the Women's WT20, and the ECB failed to provide similar coverage for the Women's Ashes. Apportioning some of their ICC windfall to professionalising the women's game in their own nations is great for those athletes, but their inability to market and promote the matches they play is an ongoing failure. "But a disproportionate amount of money was being spent - wasted, some might argue - on costs, rather than being used to develop and promote cricket in the membership." Yet under the terms of the new agreement, the test nations must be "hired out" to the ICC as a "cost", creatively allocating a billion dollars to the test nations (three in particular). The ICC development arm is being scaled back for cost-cutting, and the member dividend that goes to the developing members of the ICC left at the current level regardless of the revenue increase. For Clarke, like Srinivasan, the "membership" means his own board. "There is an argument that there was no need for change, that cricket was working fine, that the previous model was fair and sustainable. The finances of the majority of nations suggested otherwise; and most members were dependent on visits from India and England." "And in reality it's not a lot of money. The most important money is: "Does India tour you?" We all know that." No-one with any knowledge of cricket's financial structure had proclaimed it sustainable. And it is no more sustainable for the reforms that have been made, which merely entrenched the two most undesirable elements of that system: the dependence on bilateral tours from certain nations that entail the need for an touring program designed purely to make money; and the inability of that program to accommodate growth in the number of nations playing test cricket. "Look at India, in 1980 - where were they? And they won a World Cup in 1983, cricket took off in that country and they've been fairly well run. A lot of people criticise BCCI but look what they've achieved, and not one dollar of ICC money has been required to do that. If Sri Lanka, Bangladesh, Pakistan, West Indies and a few others could take a leaf out of their book, cricket would be better off. We want ten or 12 or 15 nations being competitive." As a history of Indian cricket's emergence as a financial power it is sorely lacking. No doubt the BCCI made some good decisions, but they did so in the context of the world's second largest nation opening its economy to the market, and the phenomenal growth across all sports of television income from the mid-90s onwards. But that growth is constrained by the local market; and the local market can basically be defined as GDP x Size of Cricket Watching Population. For the other full members to grow their financial bases (and both population and wealth are a significant factor in their long-term competitive ability), then they need to either increase their GDP (which is somewhat outside the remit of a cricket board), or they need to increase their base of support. In a few places this is feasible - South Africa for instance - but by and large, in the full members there is no growth to be had. Moreover, none of the other full members have particularly strong economies - lacking either population, wealth of both. The Nominal GDP of each of the big-3: UK $2.5b, India $1.8b, Australia $1.6b. Of the other 7 full members combined: $1.1 billion. There is no untapped local market they can grow to match the big-3: if retaining players, financial stability and dependence is a problem with the bilateral touring structure, it will remain a problem until it is changed. Similarly, there are few candidates to match the big-3 outside the existing full members. Each of them occupies a place in the world's dozen largest economies. Cricket is unlikely to ever occupy a central place in well developed industrial economies of comparable size. It is another sign of Clarke's myopia that he rejects the two exceptions as "pie in the sky": China continues to grow but already has a GDP larger than every full member combined; and the USA, with a population some 80 times larger than New Zealand, is twice as large again. Even a small segment of those markets is significant because cricket's economy is so small. To reject them is to reject a third of the world's economic potential. Similarly, there is ample potential for growth in the larger associates to push them into the same realm as the smaller full members, even while cricket remains a minority sport in those nations; and for other associates such as Ireland, Scotland, Nepal or Afghanistan to peak at or around that same level. But to achieve that a fundamental point needs to be grasped. Not by the big-3, but by the other full members: the problems that afflict them are the same as those at associate level. The "Irish Question" is also the "New Zealand Question": what to do with a financial light-weight that is intermittently competitive with the biggest teams. The smaller full members are as financially unstable now as they've ever been; they might have a "legally binding" future tours program, but it will leave them no better off a decade from now. There are better ways to guarantee their financial survival; methods that work in other sports, for teams in big markets and small; and which permit growth and expansion within those sports. That method is to band together: sell their tv rights collectively, and market a competitive structure in a way that lifts their profile as part of a collective, not as individual brands. Unfortunately cricket has moved further away from this model; the short and pointless bilateral tours that numb the mind and spirit remain; while associate nations have been offered a mere fig-leaf in the form of a playoff every two years. "As so often in cricket administration, these [meetings] were widely - perhaps deliberately - misinterpreted. We had to harden ourselves against uninformed and biased comment to deliver our vision for a better and more financially secure cricketing world." The failings of the ICC at governance are only partly the result of ineptitude and internal politics. They are also a symptom of insularity and arrogance. The ICC creates reports and discuss matters across a range of areas - most with no bearing on commercial operations. Yet they continually refuse to release reports that might justify their decisions, if they release details of decisions at all. They are (rightly) criticised for their poor governance, as they continue to lag behind what fans expect from the body governing their sport. The ICC - and certainly Giles Clarke - don't believe they are accountable to the fans of the sport, or the players; they are, to use his words "a member's organisation" that cares only for its (full) members. But if the bulk of those members are represented by people with no competence at their position then they will invariably make bad choices, selfish choices that ultimately hurt them too. The success of the big-3 in taking over control of the ICC (and bleeding its finances) is as much a story of the other full members inability and unwillingness to recognise the ICC as the governing body of cricket, and to cede their independence for the greater good. Their partial removal from the decision making process is perhaps a step in the right direction, as (probably) is greater influence on decision-making for the big-3. But the records to date of those now at the fore is unpromising. The reforms made have not addressed any of the governance problems identified two and a half years ago. Nor is there any prospect of them being. It may not matter: cricket has pottered along for decades with a failing financial system and poorly constructed fixturing. The only difference now is that people are starting to notice. Headlining this episode is an interview with Wisden assistant editor James Coyne (@coynejames) to talk about this year's Cricket Round the World section and the philosophy behind putting it together; the 20 year CRtW retrospective, Elk Stopped Play; and the approach taken to last year's most significant event: the governance reforms of the ICC. Andrew Nixon (@andrewnixon79) joins Russell Degnan (@idlesummers) to review the performance of the Irish women and Dutch men in the World T20; and we check in on Africa Division Three T20, won by Swaziland. There is news from Scotland and the Netherlands with the launch of the North Sea Pro Series; from the UAE who continue to press for more matches, and even the world cup; and on the ongoing poor governance at USACA. Direct Download Running Time 63min. Music from Martin Solveig, "Big in Japan"